Even though they are usually continuously monitored, radio navigation aids need to be regularly checked in flght to make sure that they are radiating correctly. To accomplish this, DCA maintained a fleet of specialised Flight Survey aircraft: initially Douglas DC-3s and later Fokker F.27 Friendships. During this period, the basic process for checking a navaid was for the survey aircraft to fly a series of pre-determined 'runs' using the aid for guidance. 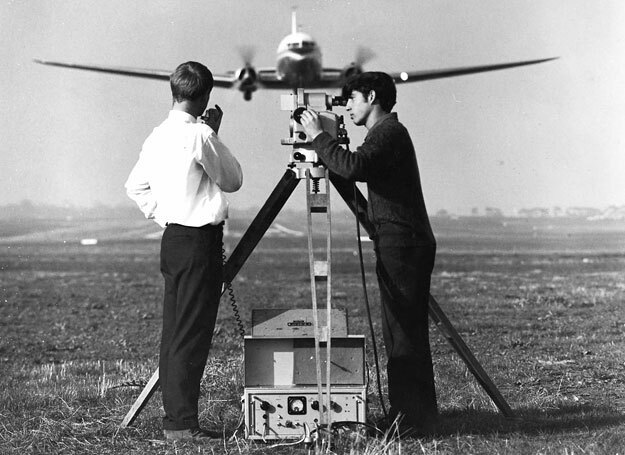 On the ground, Airways Surveyors would track the actual position of the aircraft using a theodolite set up at an accurately known position. While one Surveyor tracked the aircraft, another would use a VHF radio to relay the bearing (azimuth or elevation) to Airways Surveyors aboard the aircraft. 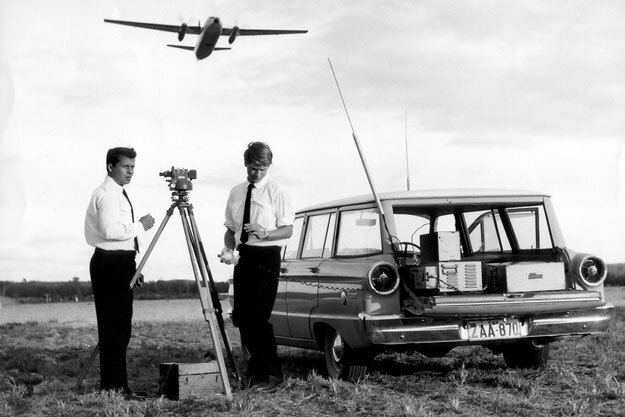 The on-board Surveyors could then compare the true position of the aircraft, relayed from the ground, with the position according to the navaid as shown by the on-board instrumentation. These readings could be compared and, if the navaid was radiating incorrectly, the necessary adjustments could be calculated and relayed back to technicians on the ground. 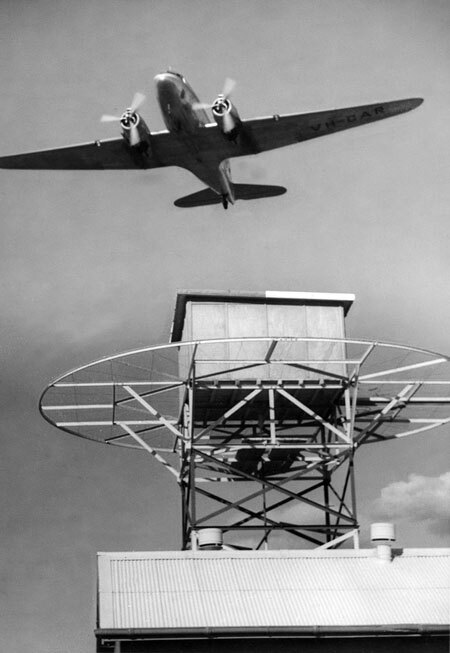 Left: DCA DC-3 VH-CAR overflying a VAR beacon on a survey flight. 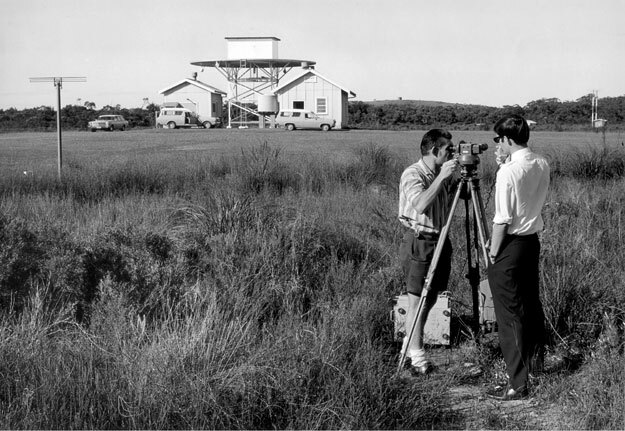 Below: Airways Surveyors checking the Coffs Harbour VAR beacon in 1970 - close to the end of the service of these beacons. The basic setup of one Surveyor on the theodolite and another relaying readings to the aircraft is evident. At left foreground is a monitor antenna. Continuous monitoring ensured that the beacon was radiatiing within established parameters between flight checks. A failure or drift out of tolerance would trigger either a changeover to a secondary transmitter or shutdown of the beacon. 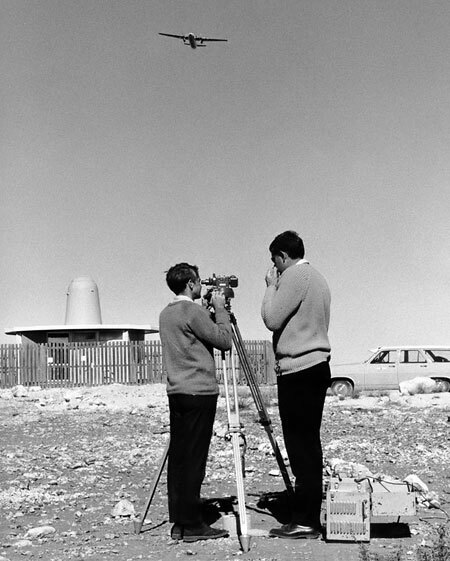 Below: Airways Surveyors checking the new Runway 27 ILS at Melbourne/Tullamarine in about 1970, just before the airport opened. This is undoubtedly a posed photo as the DC-3 survey aircraft is well past the missed approach point and very low! Above: The same processes continued into the F.27 era, in this case with the radio equipment stowed in a Departmental station wagon. Left: Every navaid, no matter how remotely sited, needs regular flight checking. In this case a VOR beacon is being checked.